A green yard is an eco-friendly yard! Topics below include green landscaping, decor, and yard design. OK, so maybe you have no lawn gnomes or pink flamingos that need a safe backyard environment. What about birds and squirrels? Personally, we like squirrels in our yard. Our neighbor Boris doesn't, but he can't bring himself to call a pest-control company, so he just taunts the squirrels with cries of "Bullwinkle was the real star—he carried Rocky!" Well... incoherent, rambling introductions aside, our yards are usually something we take a certain amount of pride in, or at least expend a certain amount of effort over. And regardless of wildlife and lawn ornaments, we want a safe, beautiful yard for our families. Today's guest article, from Jay Chua of PorchSwingSets.com, will cover a few ways to make your yard experience greener, easier, and less costly. Every person can do their part to help the environment with simple changes that start at home. In your own backyard, you can transform the traditional harmful materials and methods into a thriving, green living space. Leave behind energy-wasting products and toxic chemicals by embracing these ten green tips for backyard design and garden spaces. If you want decorative lighting around your yard, garden, or patio, try solar lights instead of traditional grid-powered lighting. It's a great way to save energy and lower utility bills—and avoid the mess of running underground electrical wiring. Around the gazebo, along the deck railing, or bordering the garden path, there are solar lights for every application. For a subtle look, consider specialty solar lights like those designed to resemble garden rocks. When shopping, consider the energy savings of solar LEDs. And if security is needed around your home, motion-sensing fixtures are available. During hot months, grilling outside reduces heat from cooking in the house. Because the air conditioner won't need to compete with the kitchen appliances, you'll save energy. Propane grills are cleanest (unless you'd like to go super-green and cook outdoors with a solar oven!). For your outdoor surfaces and hardscapes, building with natural materials will help to maintain an eco friendly design. Stone patios made with flagstone or slate are beautiful. Try to choose stone that is native to your region to reduce the total energy associated with getting that product from the quarry to your yard. Thyme planted among patio pavers can work as an attractive, low maintenance ground cover. Wooden decking can be environmentally friendly as well, when sustainable timber is used. If the wood also has natural rot resistance, you can avoid toxic paints and stains and the messy process of powerwashing. Cedar is a great choice that turns a classic grey color with time. Bamboo is a highly renewable and abundant natural resource that works well to create natural fences or other yard elements. (But you should choose "clumping" bamboo, or plant your running bamboo within in-ground root barriers, lest the bamboo eventually take over the neighborhood). Planting flowers, shrubs, grasses, and trees that are native to your area will cut down on the watering requirements for your landscaping and will provide natural pest resistance, eliminating the need for chemical pesticides. By using natives in your yard, you'll be conserving fresh water and your own energy at the same time. The local birds, butterflies, and wildlife will enjoy the habitat as well. Planting native grass varieties will require less maintenance. Allowing clover to intermingle with grass is beneficial, since clover fixes nitrogen, a key element needed for green, healthy lawns. Finally, allowing plantains and other low-key weeds to mix in with the grasses and clover—i.e. no more 2,4-D or other broad-leaf weed killers!—will provide a soft green surface that will be more resilient in the face of foot traffic, drought, and pest problems. Including a water feature in your backyard design adds a sense of calm that's hard to match. A solar-powered fountain is a good option. Koi ponds provide a great spot for some wildlife of your own and make stellar water gardens. For easy, efficient, and cost-effective watering of your containers, hanging baskets, flower beds, and vegetable garden, be sure to use rainbarrels to harvest rainwater from your roof. The water is free, contains no chlorine (which is harmful to healthy soil), and is not subject to watering restrictions during droughts. From furniture to decking to fence materials, wood is often found in a well designed yard. Making sure the wood that you choose is from a sustainably harvested regional forest is a step in the right direction. Red cedar is known for its resistance to rot and durability. Choosing naturally resistant wood for decks means you can skip the chemical sealants required to maintain normal decking materials. An alternative is to use "plastic" decking like Trex, which is made from recycled plastic bags and sawdust and does not need to be sealed. Why settle for low quality lawn and patio furniture? That just ensures you stay trapped in the "buy cheap, throw away, and buy again" mindset that now pervades our consumer culture. Instead, purchase well made pieces that are built to last. Quality garden decor and backyard furniture will keep you happy for years and can even be passed along to family and friends when it's time for a change in your backyard. #9 -- Begin Establishing an "Edible Yard"
As the economy falters and food costs rise, many more people are planting vegetable gardens. But you, the person intent on green yard design, can go a step further by incorporating food plants as landscape features. Blueberry bushes can replace some of the shrubs in the front; thornless blackberries make a great hedge row; fruit and nut trees can seamlessly stand in for other trees in your yard. You can also mix in annual food plants like tomatoes, peppers, and rhubarb, as well as plants like fennel and Queen Anne's lace to provide eye appeal and attract beneficial insects. Best of all, your edible yard is a source of fresh, nutritious food for your family. Be sure to do a little research in choosing species and varieties that will thrive in your climate zone and be resistant to pests and diseases. You're probably aware of "reduce, reuse and recycle," but don't leave out "repair and repurpose." Even quality goods will eventual need sprucing up, but because such products are built well, you can easily repair, refurbish and refinish them. (Hey, that's two more R's!) "Working the R's" is much more cost-effective and soul-satisfying than buying new. Once you've gotten your gardening operation kicked into high gear and are thinking more broadly about what it means to have a green yard, you'll start seeing ways to repurpose things that you (or others) would have previously thrown away. An old wrought-iron porch railing makes a good pea trellis; old pantyhose are good for drying your harvested onions; old yogurt containers work well for putting picked berries in. You get the idea. Going green in your yard is simple and rewarding, knowing your family will live and play in a healthier environment, today and in the future. Jay Chua enjoys living in Vancouver, Canada, close to the outdoors and in touch with nature. He and his wife Deisy love the portability of their hanging chair stand, believe in quality products, and avoid harsh chemicals in their yard. 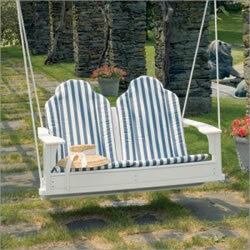 Jay's web site PorchSwingSets.com has plenty of information on green outdoor living, as well as the latest and greatest in stylish wooden swings to cater to green needs. Know a yardiac? Please forward this Eco/Green Yard Tips article to them. With the accelerating pace of development and subsequent habitat destruction, the pressures on wildlife populations are greater than ever. But everyone with access to a patch of earth can make a significant contribution to sustaining biodiversity. Planting natives in your yard provides a welcoming environment for wildlife. This doesn't need to entail a drastic overhaul of your yard or garden; the process can be gradual and can reflect both personal preferences and local sensitivities. The guru of earth ponds explains how to site, design, shape, and plant these beloved fixtures of rural landscapes—and make them fit your property and your life. Tim Matson has designed scores of ponds, each unique to its site and its owners. In Landscaping Earth Ponds, he shares what he has learned to make these captivating ponds truly fit into their landscapes and into the lives and lifestyles of their owners. "Garden Girl" Patti Moreno provides tips on in-city gardening and gives ideas on how to have less lawn and more "edible landscaping." Specific topics include raised beds, blueberry bushes, and more. Watch urban 'edible landscaping' videos.